How often have you noticed years slipping by while you were caught up in a flurry of day-to-day activities? Sometimes with all the stress of everyday life, your dreams and goals hit the back burner. Each day your dreams get forgotten a little bit more. Instead of getting a hold of things that really matter, people generally spend their time and life in pointless activities. Know that you cannot hold on to time; hence, make an effort to remind yourself of what makes you happy and fulfilled. Life is fast so just savor the moments. 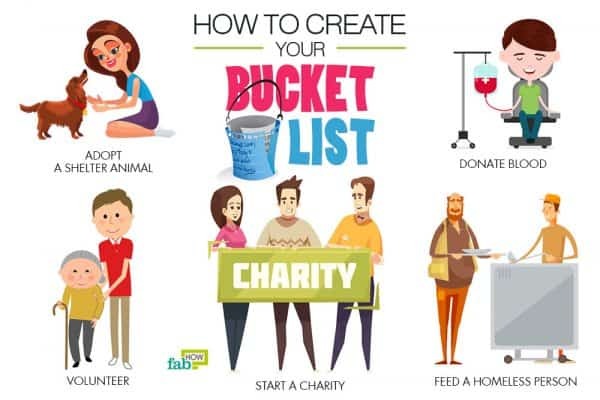 The whole idea of creating a bucket list is to maximize every moment of your existence. It helps you do things that you always wanted to do and reminds you to live your life to the fullest. Your bucket list can be endless. Keep adding new items to it as time passes, or you learn about new things. Check if all the items listed are still relevant, and if not, remove them. 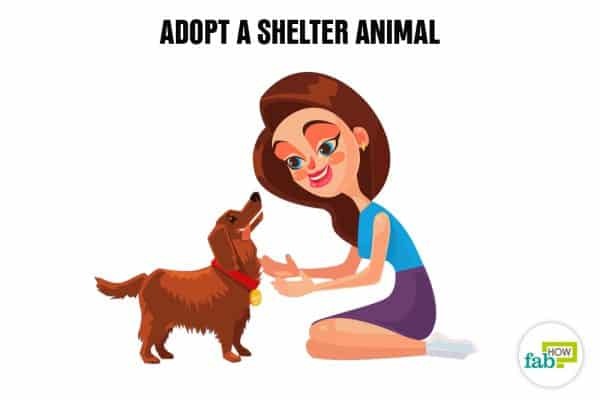 Adopt a shelter animal. 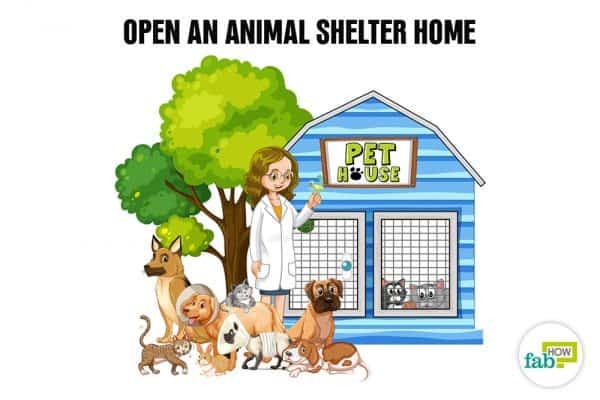 Take home with you a new furry friend. Sponsor a child. Change a child’s life by giving him monetary support. 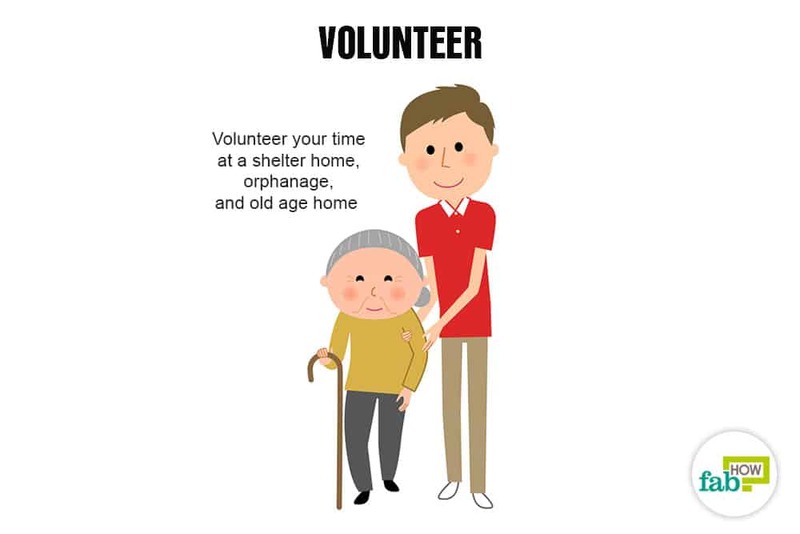 Volunteer. Volunteer your time at a homeless shelter, orphanage, a nursing home, an animal shelter, etc. Volunteer in a third-world country/developing country. Open an animal shelter home. 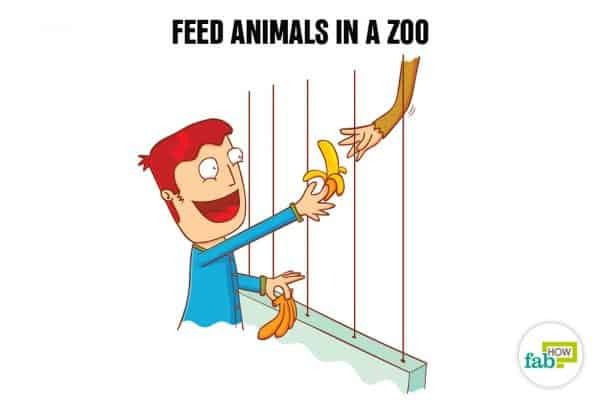 Feed animals in a zoo. 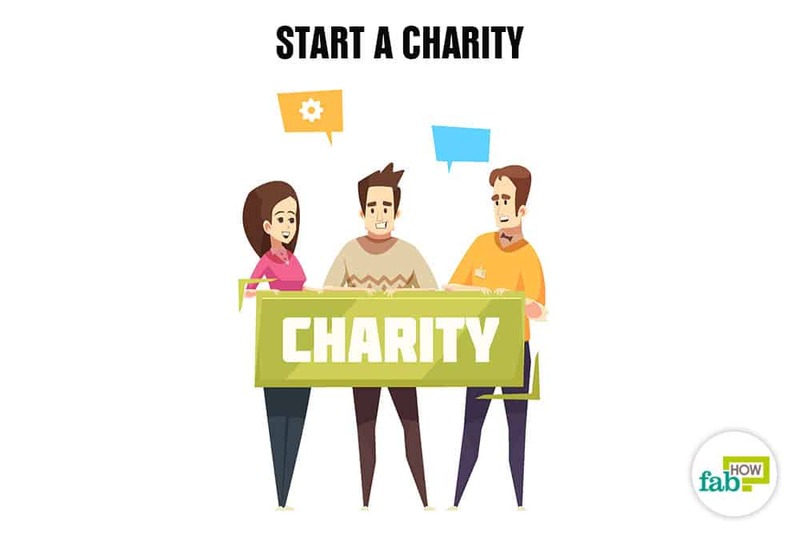 Participate in a charity walk. Your charity walk can help raise money for the needy. 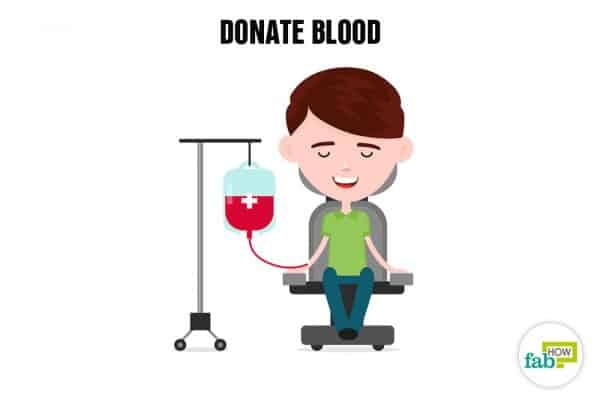 Donate blood. Help save a life by donating your blood. Donate books. Donate your books to the under privileged, a NGO, or somebody who cannot afford to buy new ones. Be an organ donor. Donating an organ can help you give a second life to someone. Do random acts of kindness. 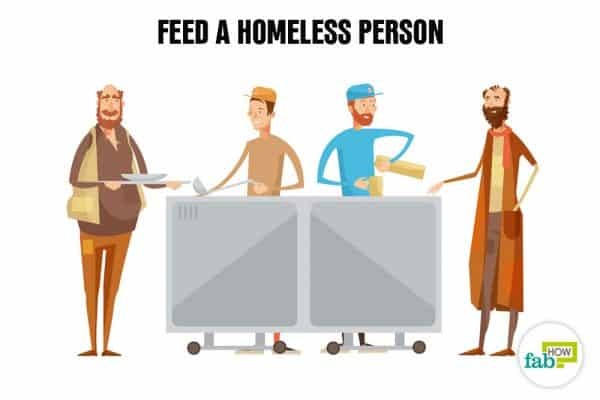 Whether it’s opening the door for an elderly at the supermarket, buying a hot cup of coffee for someone behind you in the queue at Costa Coffee, or smiling at a stranger while passing the street, try to do as many random acts of kindness as possible. Try to cheer someone up in times of distress. Be a mentor to someone. Give up meat. Eat plant-based whole foods for a month. Plant a tree. 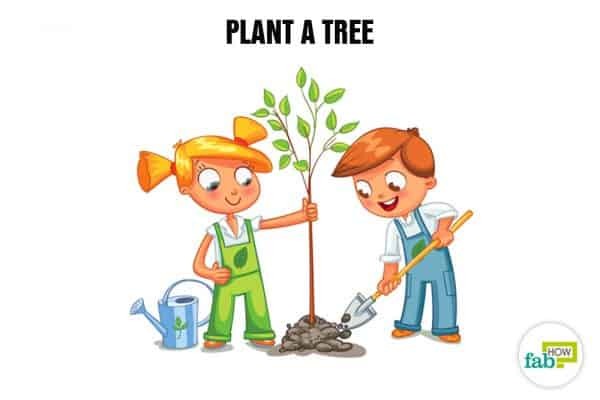 Conserve your environment by planting a tree in your neighborhood. 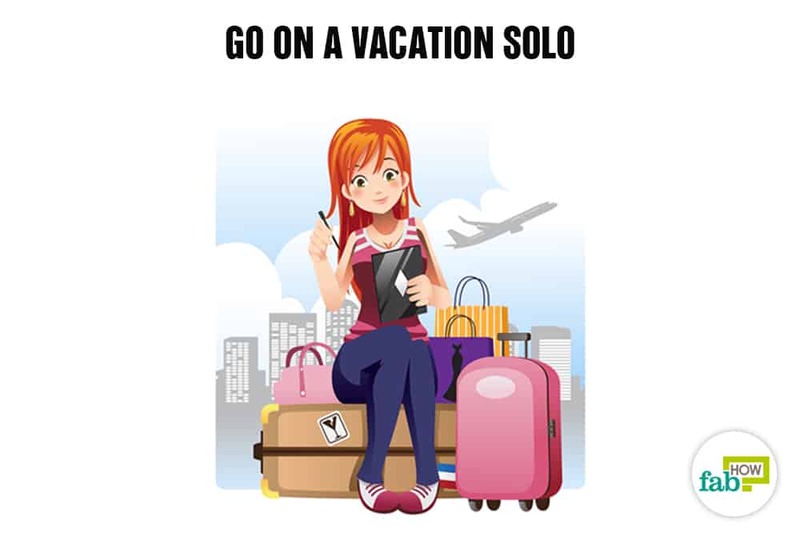 Go on a vacation solo. One of the best bucket list ideas is to indulge yourself fully by traveling alone. 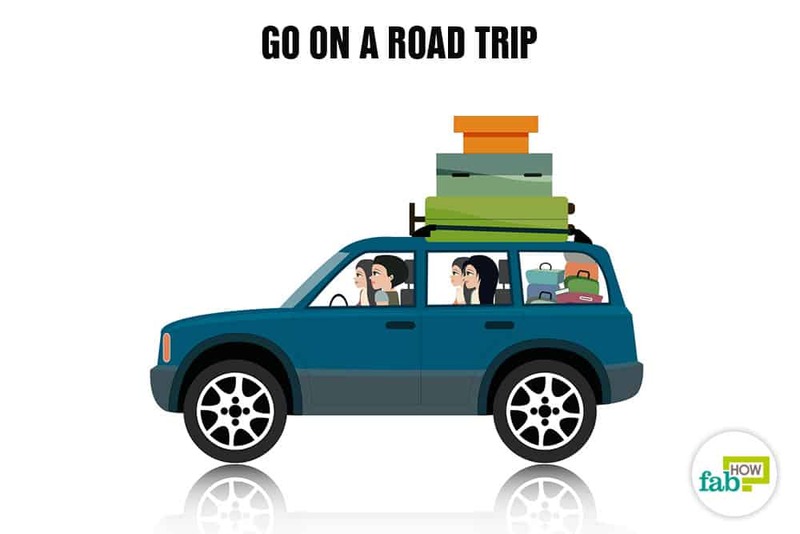 Go on a road trip. Take a road trip on a motorbike or in a convertible, and make your vacation unforgettable. Visit the Grand Canyon in the US. Hike or drive down the Grand Canyon, which is over a mile deep. Stay at the Ice Hotel in Sweden. Indulge in ice sculpting, ice fishing, sleighing, etc., on your stay at this hotel. The walls, fixtures, and fittings of this temporary hotel are made entirely of ice. Swim in the world’s largest swimming pool. Swim in the largest swimming pool in the world at the San Alfonso del Mar Resort, Valparaíso, Chile. Climb Mount Everest Base Camp. Visit Salar de Uyuni. This place is a natural salt pan in Bolivia. When it rains, this area becomes a mirror reflecting the sky above. Visit the Pyramids of Giza. Plan a trip to Egypt and witness the Egyptian wonders. Be on top of a lighthouse. Go on a safari. 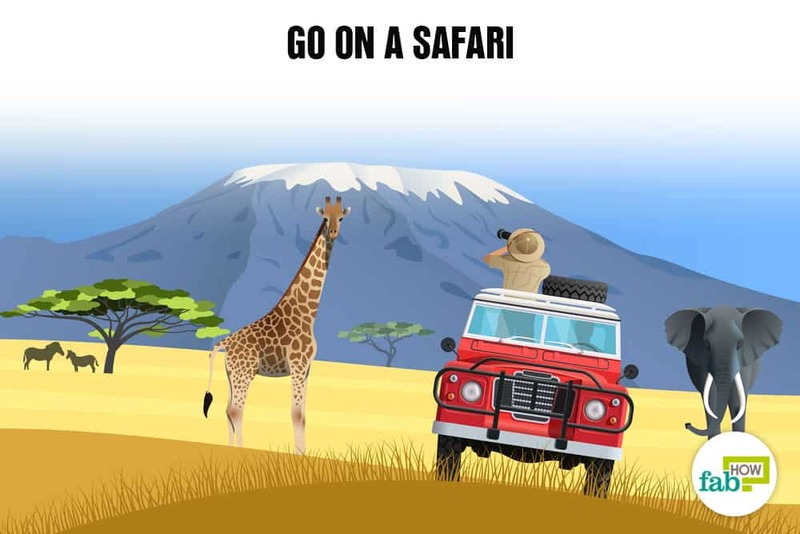 Enjoy a desert safari in the dunes of UAE or a wildlife safari in the African jungles. Spend a month in a monastery. Spend some time in a Buddhist monastery in Bodh Gaya. Spend a day in the woods. Once a week, spend all day out in the forest. Climb trees, cook a meal and have it amidst nature with your family and friends. Spend a day at an animal farm. 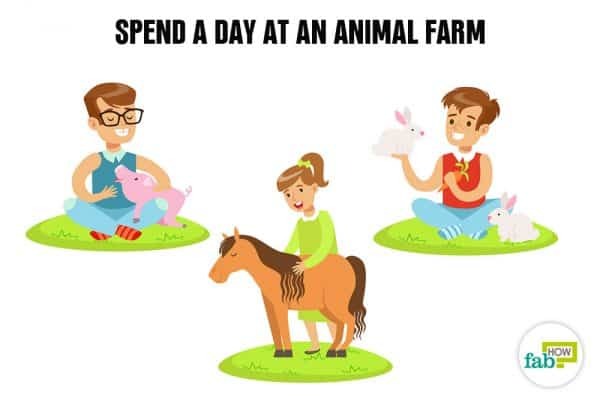 Spend your day among cows, horses, bunnies, pigs, sheep, and ducks. Spend a night on a trampoline. Spend quality time with your family on a trampoline. Bring some snacks and torches along with you. Spend an evening in a hammock. Take a nap or get a full night’s sleep in a hammock lying under the stars. Sleep in satin sheets. As far as bucket list ideas go, one luxurious thing to do would be to get some satin sheets and enjoy an incredibly comfortable doze. Sleep in a castle. Treat yourself like a royal in a historic castle that has been converted into a hotel. See the beach galaxy. Glowing blue water washes up on a beach in the Maldives. This natural phenomenon occurs because of a chemical reaction when a microorganism in the sea water is disturbed by oxygen. Watch the Northern Lights in Norway from glass igloos. Explore your city. Become a tourist in your hometown, visit museums and state parks, and explore the history of your city. Live like a local in a foreign country. Travel and live in a foreign country or province for six months. Fly in a hot air balloon. Experience the magic by flying above the treetops and just below the clouds. Stay in a 5-star resort. Spend a night in an underwater hotel. You can find them in Dubai, Maldives, Sweden, etc. to name a few. Go snorkeling. Enjoy snorkeling with manatees in the US or the corals at Los Roques. Take part in a bull run. Go bungee jumping. Pump up your adrenaline by bungee jumping off the Kawarau Bridge in New Zealand or Victoria Falls Bridge in Zambia. Go skydiving. Either do it yourself or jump with a tandem skydive instructor. Go whale watching. Plan a whale-watching tour and enjoy your cruise with dolphins, humpback whales, gray whales, and so on. Do an underwater sea walk. It is available in Mauritius and many other places around the globe. Ride a bike on a beach. Ride a mechanical bull. Clench your thighs, hold tight, and ride a mechanical bull. Do a wheelie on a bike. Ride a camel. Take a camel riding tour in Africa or the sand dunes of the Middle East. Ride a Ferris wheel. Go to a country fair and ride the Ferris wheel at least once. Slide down a water slide. Go to a drive-in cinema. Watch a romantic movie with your date or spouse in a large outdoor movie screen under the stars. Go camping. Go camping into the wilderness with your friends on weekends. Go bamboo rafting. The special thing about this is the raft which is made out of non-green bamboos. Get lost purposely. Wander around intentionally and explore a new city by taking a route that takes you through a bustling market, or along a quiet shore. Run through the sprinklers. Turn on the sprinkler at your home and run through them over and over again. Do a color run. A color run is an un-timed race where participants are doused from head to toe in different colors at each kilometer. Participants usually start in white and end up in every color you can name. Run a marathon. Run a marathon at an annual marathon event in your city. Head out on a hike Spend a fun day outdoor by taking an hour-long or all-day hike. Hike Trolltunga in Norway. Trolltunga (Troll's tongue) is a piece of rock jutting out horizontally out of a mountain about 2,300 feet above a lake. Cycle down a bike trail in your city. Go Zorbing. Zorbing is a recreational activity where you get to roll downhill inside an orb, made of transparent plastic. Go to La Tomatina. La Tomatina is a festival held in Spain in which participants pelt each other with tomatoes. Dine out alone. Treat yourself to a dinner at your favorite restaurant without your phone, book, or magazine. Go to the movies alone. Take a break from having to be social and watch a movie without any sort of distraction. Watch all the movies in the IMDb top 250 Movies of All Time. Attend a wine-tasting event. Search for a wine-tasting event in your city and go for it. Go to a comedy club. Visit the club on a weekly basis and release all your stress and tension by laughing out loud. Visit a health retreat. Unwind, relax, and experience a sense of holistic well-being. Live next to a lake. Buy or rent a house by a lake and enjoy the sunrise and sunset, indulge in fishing, swimming, and other blissful activities. Catch and cook a live fish. Cook a dish of a different origin. Get to know your neighbors. Bake cookies and take them to your neighbors. This will serve to be a great ice-breaker if you are new to the neighborhood. Unplug for a week. Turn off your phone, shut down your laptop, and stay away from your TV. You can trade the electronics for some self-reflection time or time with your family. Go a whole day without spending money. Curb the urge to splurge. In fact, stop yourself from buying even the necessities for a day. Go mirror-less for a day. Avoid checking yourself out in the mirror for a day. Color your hair in funky colors. Embrace the summer and give a summery tinge to your hair by going yellow, purple, blue, or even pink. Get a professional photo shoot done. Get a fish pedicure. 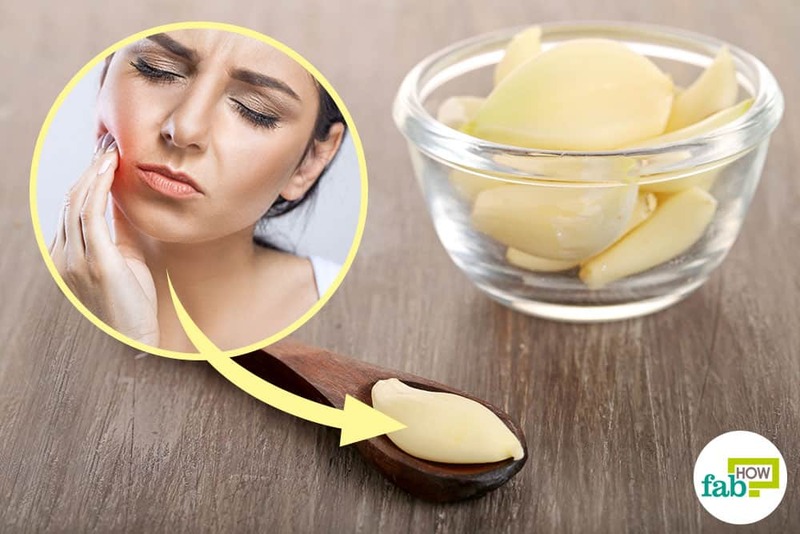 This is a way of removing dead skin cells, cleaning your feet with the help of tiny fishes. Fit into your old skinny jeans. Get a tattoo. Show off your personality and style by sporting your favorite image or design. Stay in bed and have breakfast. Do this once a week. Quit a bad habit. Whether it’s smoking, drinking, or any other addiction, try to quit a bad habit that has enslaved you. Become an early riser. It is one of the best habits you can adopt. Say no more often. Practice saying no more to things you do not wish to do. Stop procrastination. Make better use of your time by overcoming your habit of procrastination. Become more confident. Get out there and work on your confidence. Take your own decisions, own up for every little thing that happens in your life. Learn to forgive and let go. Forgive those who have wronged you and clear out the mental clutter. Research/create your family tree. Create a sense of your roots and belonging by researching or creating a map of your lineage. Get a complete health check-up done. Start a journal. Keep a gratitude journal and write down things you are grateful for in life. Read all the books you own. Write thank you notes. Be grateful to people who had a positive influence on you. Let them know how much they mean to you. Be positive. Try to make positivity an everyday habit. Give a heartfelt surprise to someone. Send a bouquet to your spouse at work, cook a nice dinner for your parents when they return from home after a long day, or simply send a heartwarming message to someone. Get in touch with your past teachers. Find an old friend or a crush from your school days. 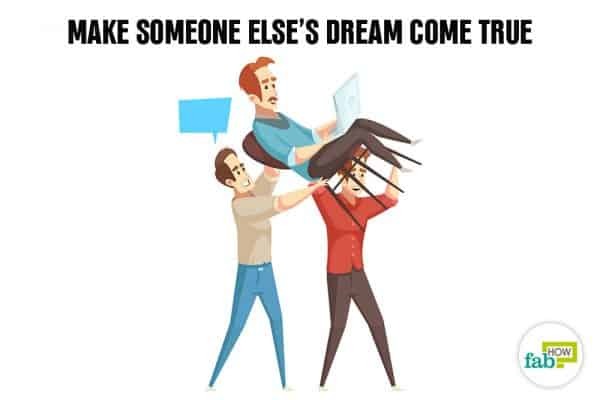 Look for them over the social media and connect with them. Try to be more social. Attempt to be more social and try to overcome your shyness. Visit your childhood home or neighborhood. You may be surprised to witness the changes there. Write a letter to yourself. Write a thoughtful letter to yourself and tuck it away to read it after 10 years. Write a letter to your future generations. Leave a note for the children of your children's children to know about the history of your legacy. Leave a note. Leave an inspirational note in a library book for the next reader. Give friendly hugs to trees. You can feel them loving you back. Take up a horse-riding course. Get training in basic horse-riding skills and gallop away your stress. Bet on a horse race. Learn the art of juggling. Master all the juggling tricks. Take up a new sport. Learn archery. Master the art of shooting with a bow and arrow. Learn a foreign language. Learning foreign languages lets you connected to the world. Take an art class. Discover your hidden talents by taking up an art and crafts class. Enroll in a theatre workshop. Learn new skills and get some creative inspiration by enrolling yourself in a theatre workshop. Enter a writing contest. Reach out to millions of readers who haven’t discovered your writing. Write a children’s blog or book. Create and sell an art piece. Sell some pieces of art you created. Learn pottery. Try your hand at the pottery wheel. Learn a new word each day. Expand your vocabulary by learning a new word each day. Learn a musical instrument. Get creative and learn to play the piano, the guitar, or drums. Learn to meditate and do yoga. Take up meditation and lead a stress-free life. Create a vegetable garden. Grow your own fresh organic vegetables your family loves to eat. Sew a memory blanket. Display your love by making a blanket out of your family pictures. Raise butterflies, toads, caterpillars, and turtles. Grow a habitat garden in your backyard and raise butterflies, wasps, dragonflies, birds, bees, toads, and ladybugs. Catch fireflies. Go outside at night and catch the flashing bulbs. Attach notes to balloons and release them. Write messages, remembrances, poems, quotes, or blessings in a paper and slip it into the balloons before blowing them up or attach the paper to the ends of the balloon strings. Release sky lanterns at a lantern festival. Fly a kite. Get off your couch and send your kite soaring into the sky. Go star gazing at a beach. Spot the planets, stars, and galaxies in the company of your family and friends. Identify 10 constellations. Wish on shooting stars. Make your dreams come true by wishing on a shooting star. Find shapes in the clouds. Pass a lazy afternoon by identifying what the various clouds remind you of. Go bird watching. Grab your binoculars and run through the woods until you spot the beauty you are searching for. Go on a photography expedition. You don't need a professional camera to take good pictures and enjoy your passion for photography. Go creative with your smartphone and take random pictures of things you like. Dance under the moon and stars in the middle of the night. Play your favorite track over and over again. Let it go on until you get tired of it. Collect seashells. Go to the beach and collect seashells. Put them in a mason jar and display it in your home. Toss a coin in a fountain. Make a wish and toss a coin in a fountain and see whether your wish gets fulfilled. Send a message in a bottle. Write a note or a letter, insert it into a bottle, and throw it into the ocean. Become an expert at climbing trees. Roll downhill to a huge pile of leaves. Make a snowman. Go outside on a snowy day with your kids, play in the snow, and teach them to make a snowman. Make a portrait. Either make a portrait of yourself or have it made by a local artist. Ride in a canoe. Experience the thrill of the water without getting wet. Charter a yacht. Sit back and enjoy the world pass by in the boat of your dreams. Have a huge fireplace in your home. Sit in front of a fireplace when it’s snowing. Get a hot cup of chocolate and your favorite while sitting in front of a fire. Swim with sea creatures. Get once-in-a-lifetime and unique experience by swimming with sea creatures and mammals. Cross over a suspension bridge. Spend a day relaxing in natural hot springs. Stand by the ocean or lake and yell into the wind. 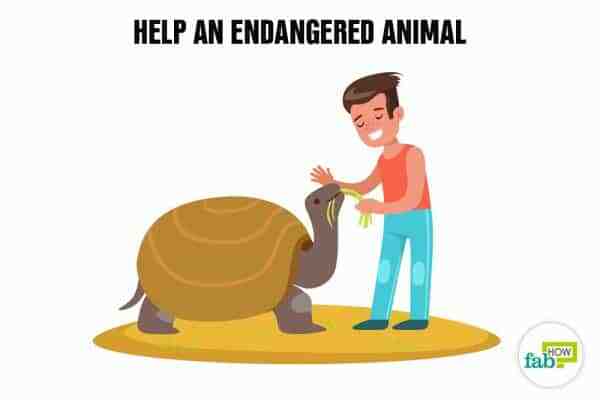 Bathe an elephant or any animal other than your pet. Hang out with elephants or other animals at a National Park and enjoy bathing them. Get a book signed by your favorite author. Attend a music festival or concert. Take photos on each day for a year. Once you are done with all the clicking, save them and make a photo album. Take a picture of yourself jumping. Get your photo published in a newspaper. Ride in a limousine. Slide in the back of a stylish, comfortable, and spacious limousine to experience the class and luxury of riding in an elongated vehicle. Throw a surprise party for someone. Play Marco Polo. Get into the pool with your friends and relive your childhood. Play a game of paintball. Host a barbeque. Host a barbeque for your friends and family and make sure to include hamburgers, hot dogs, salads, and corn on the cob. Watch a baseball game at a stadium. Every baseball fan should do this often. See a Sumo Wrestling match. Go to Bali for soul searching. Be a part of a flashmob. A flashmob is a group of people who assemble at a public place and performs an act such as a group dance and disperse. Sing karaoke. Face your fear, take up the microphone, and sing karaoke in your city. Be a bridesmaid or a best man. Attend a wedding in a foreign country. Attend a dinner theater event. Dinner theater involves a restaurant meal with a staged play or musical. Attend a paint party. A paint party is essentially an evening that mixes a creative class with tasty cocktails. Bond with your family by attending the event once weekly. Chu Q, Grühn D, Holland AM. LIFE IS SHORT - MAKE A BUCKET LIST: HOW AGE AND TIME HORIZON IMPACT MOTIVATIONS. Innovation in Aging.